Champagne – the great celebratory sparkling wine. For me, it’s optimism in a bottle; an immediate feel-good emotion. A recent trip last October to the Champagne region of NE France about 130 kms from Paris was an experience in geography, history, tradition, science and an exploration of champagne style and tastes. In each of these four Grande Marque Champagne Houses of Billecart-Salmon, Krug, Roederer and Bollinger, we were impressed by the infinite attention to quality and detail. This was particularly evident in the precise knowledge of hundreds of individual small plots of vines throughout this most northerly wine region of France. It is the nuances of soil composition, orientation to the sun, topography and other details which singularly or together create the subtle differences in the wine from each plot which is so important in the essential blending process to make top quality champagne. The Champagne Appellation d’Origine Controllée (AOC) designation governs all aspects of the production of champagne from planting to labeling and production in the Champagne delineated area of over 35,000 hectares. Only sparkling wine produced in this area can be called champagne and the Champagne Houses are relentless in their protection of this name. Three main grape varieties are permitted in champagne making: Chardonnay, Pinot Noir and Pinot Meunier. Generally, champagne is white although most Houses create a rosé. There are exceptions to the standard approach: Blanc de Blancs is made from Chardonnay and Blanc de Noirs is made from Pinot Noir and Pinot Meunier. The four most important wine growing areas are Montaigne de Reims (mainly black grapes) , Côte des Blancs (mainly Chardonnay), Vallée de la Marne and Côte des Bur . These areas are outlined on the Wine Spectator map included. 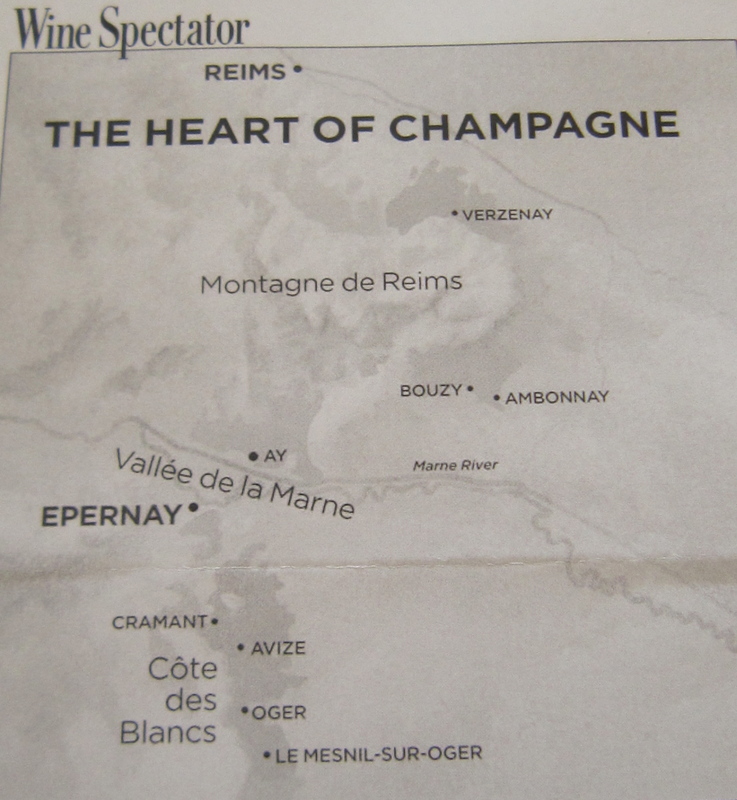 It identifies the “heart of Champagne” around Epernay and Reims, however, there is a Champagne area further to the south which is not visible on the map. So where do the champagne bubbles come from? The quick answer is that they are made through a natural process in the bottle. The Champagne AOC requires that the traditional method of champagne production is used which requires both the mandatory secondary fermentation in the bottle and minimum periods of maturation on the lees (dead yeast molecules) of 15 months for non vintage champagne and 3 years for vintage. The top Champagne Houses allow for much longer maturation periods – 10 years is not unusual – to create their signature styles. Champagne is made in several complex steps which I won’t attempt to elaborate. Some key elements only are referred to below. Each Champagne House uses their own specific approaches to create their Champagne House signature style and flavour. An important fact to note is that the grapes are harvested according to the plot where they are grown and the still wine produced from each plot is kept separate until the blending stage. This means that the nuances from the individual plots are retained. This individuality is important in the detailed and exacting process of sampling and assessing the still wine from each of hundreds of plots. In non-vintage wine where consistency across years is the objective, the chosen individual wines are blended together with reserved wines from previous years to create the assemblage (blend) for that year. The reputation of each Champagne House rests significantly on this sampling, assessing and blending of different wines. It’s the alchemy of champagne making and the responsibility of the cellar master and the blending committee. It is after bottling and with the addition of a liqueur de tirage ( including sugars and yeast nutrients) that the bubbles are made during the secondary fermentation. The mystery and sophistication of champagne has been carefully nurtured over time. The four Champagne Houses we visited were founded in the 19th century although Roederer has its origins in the 18th C. Apart from Krug which is part of the LVMH Moet Hennessey Louis Vuitton corporation, the Houses are independent and have passed from generation to generation. Even at Krug, Olivier Krug, 6th generation of the Krug family is still actively involved in the business. The Champagne region is steeped in history. Much of the area was significantly affected by World War 1. Half the Louis Roederer vineyards were destroyed in that war. During that period the Bollinger cellars were used as a hospital, courtesy of Mme. Bollinger. The history of Reims, a major hub in the Champagne industry goes back to the Roman times. For more than one thousand years the sovereigns of the Franks and then France came to the Cathedral or its predecessor to be crowned (816 – 1825). Keeping pace with more modern times, the great Gothic Cathedral is home to stained glass designed by Marc Chagall and installed in 1974. 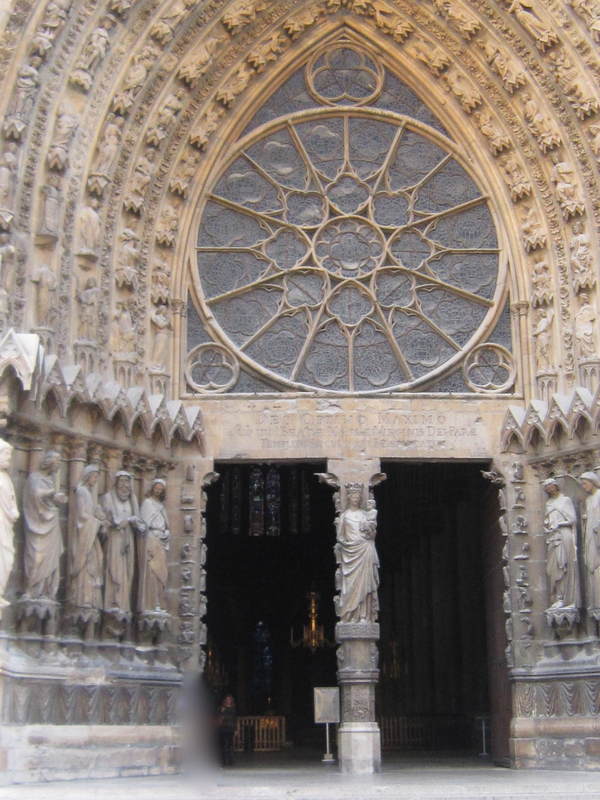 With only time for a brief visit, we walked from the bright October afternoon sunshine into the shadowy, chiaroscuro atmosphere of Reims Cathedral. Our footsteps sounded heavy as we walked up the aisle admiring the vaulting and the brilliance of blue and red shafts of light from the stained glass. Before leaving this inspiring place we followed our usual practice of lighting a wax taper, casting our own pencil of light into the shadows. In the Part 2 of 3, I will write about our visit the same day to Billecart-Salmon and Krug. This entry was posted in culture, French Wines, History, wine tasting, wine tourism and tagged Champagne, France, French Wines, Wine, wine tasting notes by elizabethsvines. Bookmark the permalink. I have always wondered how they get these bubbles into champagne. Now I know. A fascinating article on ‘optimism in a bottle’! Thanks for sharing.